Study design and workflow. 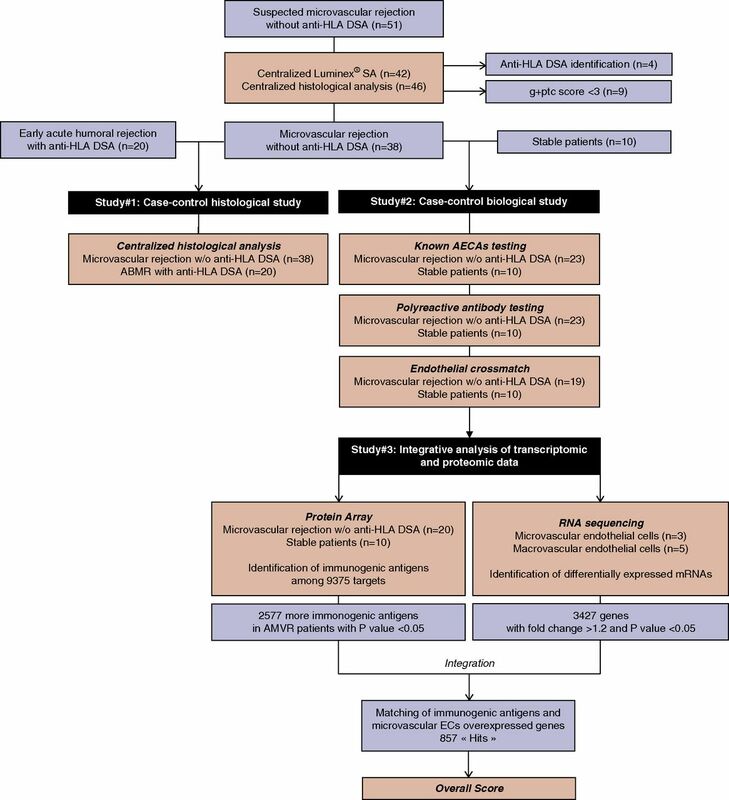 A nationwide survey identified patients suspected having of early (<3 months post-transplant) microvascular (glomerulitis and peritubular capillaritis score ≥3 according to the Banff classification) rejections of a renal allograft. After centralized Luminex SAFB assay testing and central reading of the biopsy specimens, 38 patients were retained for two parallel substudies. A case-control histologic study (study 1) addressed the histologic characteristics of the 38 AMVRs compared with 20 patients with early acute AMR associated with anti-HLA DSAs. A case-control biologic study (study 2) focused on identifying non-HLA antibodies using several approaches and used pretransplant serum samples from unsensitized KTRs who remained stable during the first year after transplant and were used as controls. 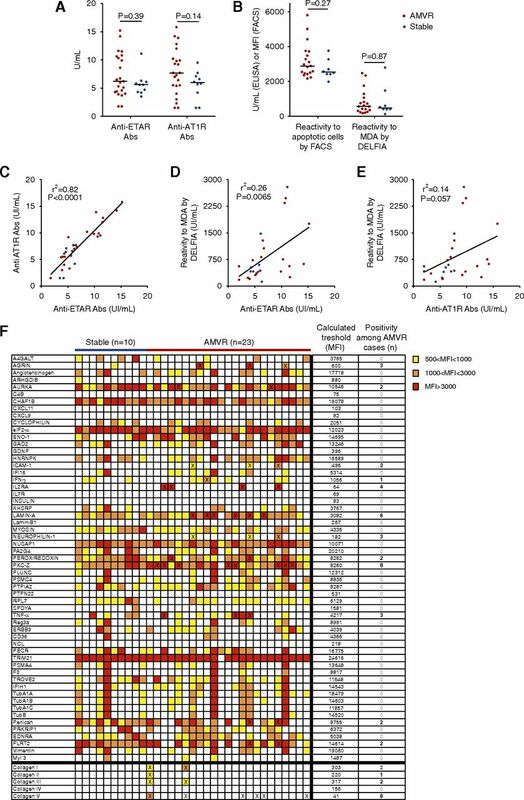 Finally, an integrated analysis of transcriptomic and proteomic data were performed to identify antibodies targeting glomerular cell-specific antigens (study 3). 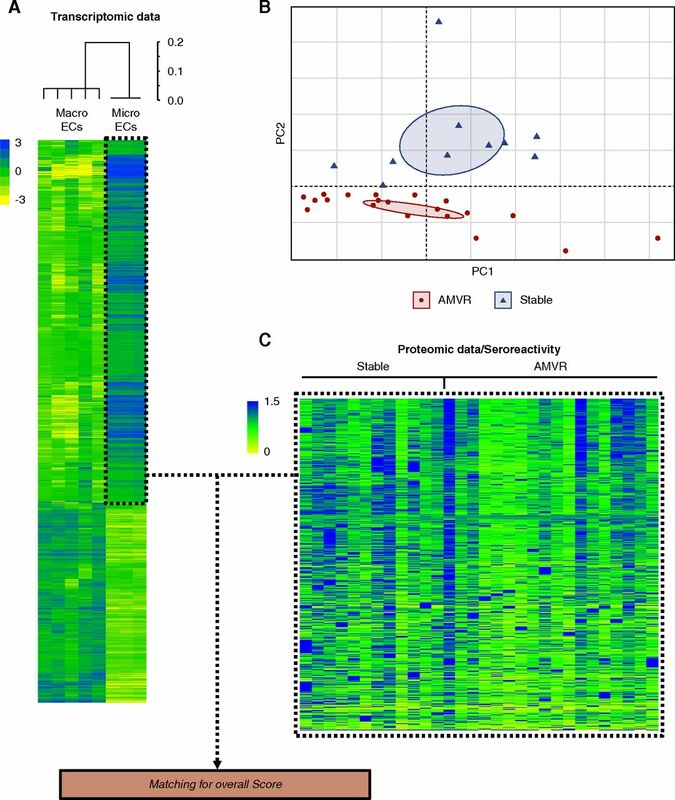 For this aim, the differential transcriptomic profiles of microvascular glomerular ECs and macrovascular ECs were combined with the global seroreactivity toward protein arrays of serum samples collected immediately before transplantation from KTRs with AMVR or stable KTRs. Representative pathologic characteristics of the early AMVRs. (A) Mean (±SEM) values of the elementary lesions assessed using the Banff classification in the biopsy samples from 38 KTRs at time of AMVR. (B) The glomerulitis and peritubular capillaritis (g+ptc) scores of the 38 individual patients with AMVR. (C) Image of periodic acid–Schiff (PAS) staining showing severe glomerulitis with partial to complete occlusion of glomerular capillaries by infiltrating leukocytes (mononuclear cells and neutrophils cells) (arrows). (D) Image of PAS staining showing severe peritubular capillaritis (ptc3) with more than ten inflammatory cells in dilated capillaries (arrows) associated with diffuse interstitial edema (+). (E) Image of PAS staining showing intimal arteritis v2 with mononuclear cells underneath the endothelium and occlusion of more than 25% of the arterial lumen (⋆) associated with peritubular capillaritis (+) and sparse inflammatory cells within the interstitium. (F) Image of Masson trichrome staining showing severe glomerulitis with complete occlusion of glomerular capillaries by infiltrating leukocytes and EC enlargement. EC enlargement is also present in arterioles (arrows). (G) Image of Masson trichrome staining showing thrombotic microangiopathy characterized by thrombi in the glomerular capillaries (⋆) associated with glomerulitis, peritubular capillaritis, and diffuse interstitial hemorrhage (+). (H) Image of Masson trichrome staining showing a mixed rejection with diffuse interstitial inflammation and tubulitis (arrow), glomerulitis open star, peritubular capillaritis (+), arteriolitis (⋆), and interstitial hemorrhage. Assessment of known AECAs. 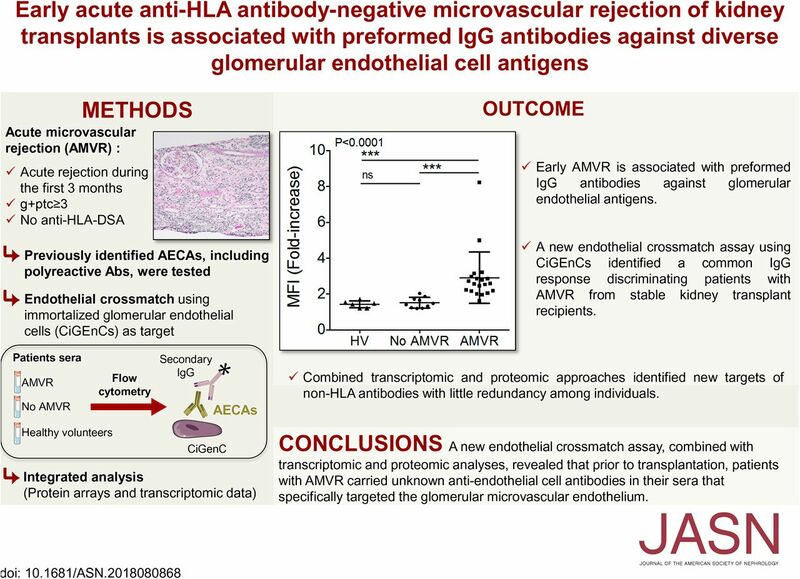 (A) Titers of anti–AT-1R and anti-ETAR antibodies in serum samples collected on the day of transplantation from 23 patients with early AMVR without anti-HLA DSAs and ten nonsensitized KTRs who did not experience any rejection during their first year after transplant and were used as controls. P values were determined using the Mann–Whitney test. (B) Assessments of natural polyreactive antibodies were conducted using flow cytometry to detect reactivity to apoptotic cells or using a dissociation-enhanced lanthanide fluoroimmunoassay (DELFIA) to detect reactivity to malondialdehyde (MDA) in 19 patients with AMVR and eight controls. P values were determined using the Mann–Whitney test. (C) Correlation between anti–AT-1R and anti-ETAR antibody titers at the time of transplantation. (D) Correlation between NAbs reactive to MDA and anti-ETAR antibodies at the time of transplantation. (E) Correlation between NAbs reactive to MDA and anti–AT-1R antibodies at the time of transplantation. (F) Analysis of the seroreactivity of serum samples from ten stable patients and 23 patients with AMVR toward 62 non-HLA antigens using single-antigen flow bead assays. The color of each box indicates the mean fluorescence intensity (MFI) of the reaction of the sample to an individual antigen. The thresholds for defining a positive reaction of the patients with to each individual antigen were calculated on the basis of the mean MFI of the control group of stable patients. Samples with an MFI less than the mean+3 SD were classified as negative and samples with an MFI greater than the mean+3 SD were classified as positive. The number of positive samples is provided on the right and the samples that reached the threshold for positivity are indicated with a cross. The seroreactivity against glomerular ECs was significantly increased in sera from patients with AMVR. Sera (diluted 1:4) were incubated with ECs. Antibody binding was detected using fluorescently labeled anti-human IgG, and the mean fluorescence intensity (MFI) was measured using flow cytometry. (A) Comparison of the reactivity of sera from healthy volunteers (HVs; n=6) and KTRs with (n=19) or without (n=10) early AMVR and without anti-HLA DSAs toward unstimulated immortalized human glomerular CiGEnCs. The data are presented as a fold increase in the MFI compared with a pool of AB serum samples used as negative control. The P value was calculated using the Kruskal–Wallis test. Asterisks depict significant differences in pairwise group comparisons calculated using Dunn posttest. ***P<0.01; ****P<0.001. (B) Sera (diluted 1:4) collected on the day of transplantation or at rejection from four patients with AMVR without anti-HLA DSAs were incubated with unstimulated microvascular CiGEnCs. Representative histograms showing IgG binding are shown; values indicate the geometric MFIs. 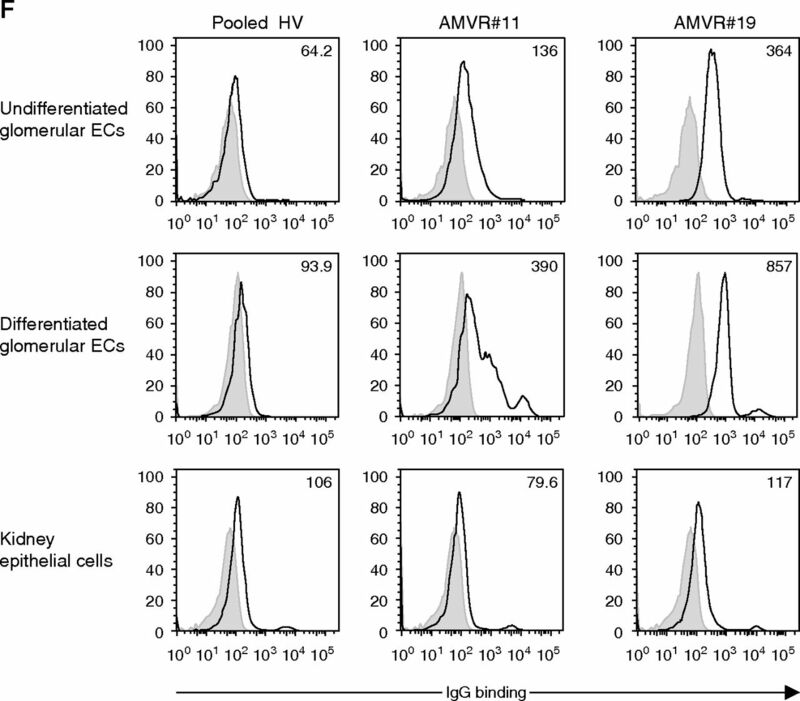 (C) Serial dilutions of sera from patient AMVR#11 or a pool of HVs were incubated with renal microvascular CiGEnCs before the detection of antibody binding using anti-human IgG. Data are presented as the geometric MFIs. (D and E) Sera (diluted 1:4) collected on the day of transplantation from 19 patients with AMVR were incubated with (D) renal microvascular CiGEnCs or (E) primary cultures of macrovascular arterial ECs before (unstimulated) or after a 48-hour stimulation with TNF-α and IFN-γ. A pool of AB sera was used as a negative control (CTL). A cut-off of a two-fold increase in the geometric mean value of patients’ sera compared with the negative control was established to define reactive sera. (F) Sera (diluted 1:4) collected on the day of transplantation from two patients with early AMVR or a pool of serum samples from HVs (n=6) were incubated with renal microvascular ECs or epithelial cells. 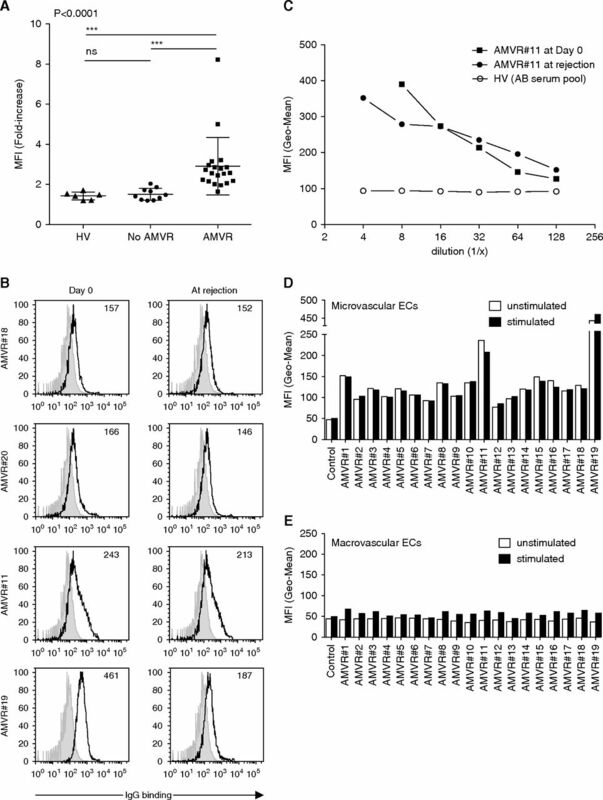 Microvascular ECs were used before or after in vitro differentiation. Representative histograms showing IgG binding are shown, and the values indicate the geometric MFIs. Integrated RNAseq-protein array analysis. (A) Unsupervised principal component analysis of the global seroreactivity profiles of serum samples collected immediately before transplantation from patients with AMVR (n=20) and stable KTRs (n=10). Average fixation signals of the immunogenic antigens were used. Ellipses of confidence (0.95) are presented for each group. (B) Clustering and heat map representations of the transcriptomic data from microvascular and macrovascular ECs. Cell samples (n=3 for microvascular ECs and n=5 for macrovascular ECs) are arranged along the x-axis and differentially expressed genes (n=3427) are arranged along the y-axis. The color of each cell reflects the fold change in the expression of each gene. (C) Heat map representation of the seroreactivity patterns of patients with AMVR and stable KTRs. Sera are arranged along the x-axis, whereas immunogenic antigens are arranged along the y-axis. The color of each cell reflects the normalized average fixation signal of an individual serum to one antigen. MFI, mean fluorescence intensity; mTOR, mammalian target of rapamycin; IGIV, IG intravenous; post-Tx, post-transplant. ↵a In patients with a follow-up >1 yr.
TCMR, T cell mediated rejection. ↵a Intensity represents the average ratio of observed reactivity exceeding the cut-off for sera from stable patients and patients with AMVR.